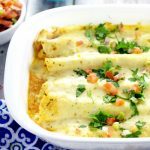 Creamy and rich with added pops of flavor from onions and peppers, these Creamy Shrimp Enchiladas are easy enough for family dinner and elegant enough for a date night in. Heat a large skillet over medium heat. Add frozen SeaPack Shrimp Scampi, onions, and red pepper. Cook until sauce melts away from the shrimp, stirring occasionally, about 10 minutes. When sauce is melted, scoop out 2 tablespoons (try not to get many onions and peppers), and place in a dish. Set aside. Place cilantro, chili powder, and cayenne pepper in the skillet with the shrimp mixture, and continue cooking until shrimp is cooked through, about 5 more minutes. When shrimp is cooked through, add 2 tablespoons flour. Stir to combine, and allow the mixture to heat back up. When shrimp mixture is hot, add milk, a little at a time. Stir vigorously to combine. Stir in sour cream, and remove from heat. Fill each tortilla with about 1/4 cup of the shrimp mixture, then roll up. Place in a lightly greased 9"x13" baking dish, and set aside. In a large skillet (you can use the same one you used earlier!) over medium heat, heat the 2 tablespoons of scampi sauce you reserved earlier. When butter is hot, stir in 2 tablespoons flour, and allow mixture to heat back up, about 2 minutes. Slowly add milk or half-and-half and stir to combine. Allow mixture to heat to steaming (but not boiling). When mixture is steaming, start adding cheese slowly. Stir to combine. Stir in salsa verde, and remove from heat. Pour cheese sauce over shrimp enchiladas. Bake in a 350° oven for about 10-15 minutes, or until heated through.